The official Philippine tourism theme “It’s More Fun in the Philippines” is getting a huge boost in Myanmar with the Philippine Embassy adopting the popular tourism slogan and logo in its souvenir bags. The catchy slogan and colorful logo are printed on both sides of the souvenir paper bags, which the Embassy distributed during the celebration of the 115th anniversary of the proclamation of Philippine Independence in Myanmar. The Philippine Embassy believes that distributing these bags will promote Philippine tourism in Myanmar’s transforming social landscape, among other Embassy activities. 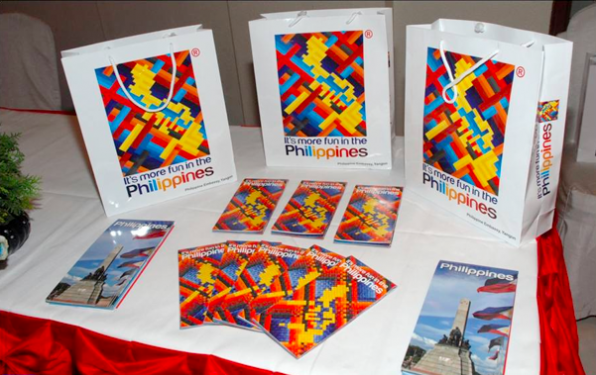 The attractive bags were filled with Philippine products that were offered to Embassy guests during the National Day Reception including Myanmar government officials, members of the diplomatic corps and Filipino community, and representatives from the business, media and travel sectors.